In the last few years, exogenous ketones (specifically, ketone salts and ketone esters) have become a popular way to get into ketosis — a state in which your body burns fat for fuel instead of carbs. Exogenous ketones are great for almost everyone. If you eat carbs, ketone salts or esters can give you some of the benefits of keto without the carb restriction. And if you’re already on a ketogenic diet and you want an extra boost, ketone supplements can help. There are two main kinds of exogenous ketones: ketone salts and ketone esters. While both products can get you in ketosis, there are some differences between the two. In this article, you’ll learn about the different kinds of ketone supplements, the benefits of a keto diet versus exogenous ketones, and how to use exogenous ketones. First off, here’s a quick explanation of what ketones are. Ketones are little bundles of fuel that your body makes when it burns fat. On a standard diet, your cells use glucose (sugar) for energy. But if you eat a ketogenic diet — cutting out carbs so your body doesn’t have any glucose to use for energy — you’ll start to burn fat as your main energy source. When you’re in ketosis (burning fat for fuel), your liver breaks fat down into energy-rich ketone bodies, then sends them through your bloodstream to fuel your cells. Forget about acetone for now and focus on BHB and acetoacetate — your energy ketones. Don’t worry about all the hairy details though. Big takeaway? Burning fat in ketosis generates BHB (a ketone), which leads to ATP (energy) production. That’s how nutritional ketosis helps you turn fat into energy. Blood sugar first. You want your blood sugar as steady as possible, and you generally want it to be low, too. If you’ve ever eaten lots of sweets or refined carbs, you know what high blood sugar does to you — you get a rush of energy, followed by a big sugar crash, crankiness, low energy, and so on. 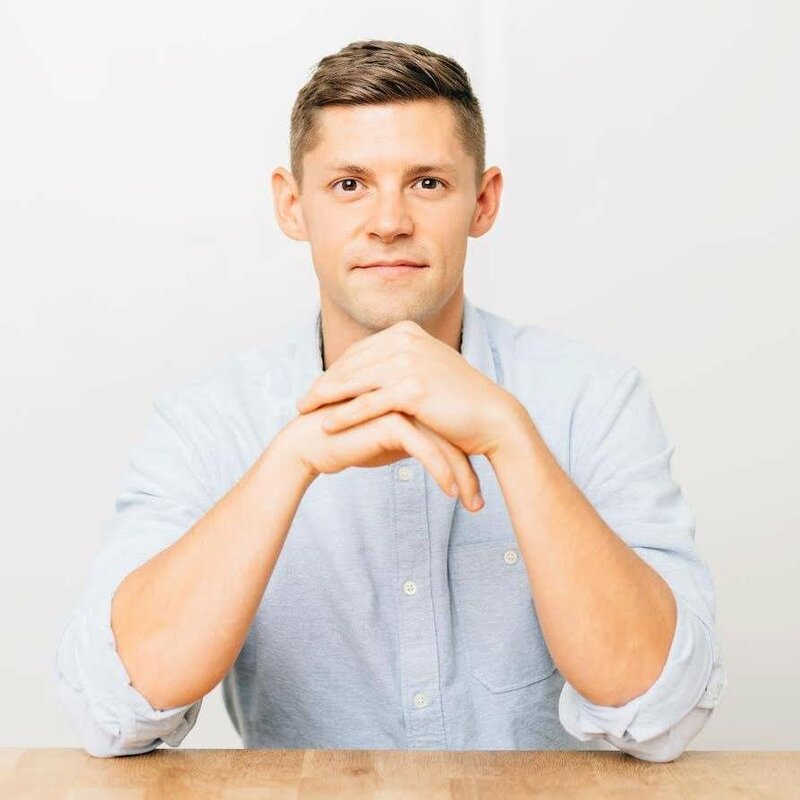 On keto, your blood sugar stays steady throughout the day, giving you stable, consistent energy. Eating a keto diet also increases the amount of fat you burn. You burn dietary fat (from food) first, but anytime you don’t have dietary fat in your system, you’ll switch right to burning body fat. That’s one of the biggest reasons why a keto diet is so effective for weight loss. That’s how a full-on ketogenic diet works. Now let’s talk about the benefits of exogenous ketone supplements. Reduced hunger and weight loss. Ketones suppress appetite, whether you get them from a keto diet or from a ketone supplement. Taking exogenous ketones can help you curb your hunger, which makes them a valuable tool for weight loss [*]. Mental focus. Your brain thrives on ketones — so much so that Alzheimer’s researchers have begun using exogenous ketones to relieve symptoms of neurodegeneration [*]. 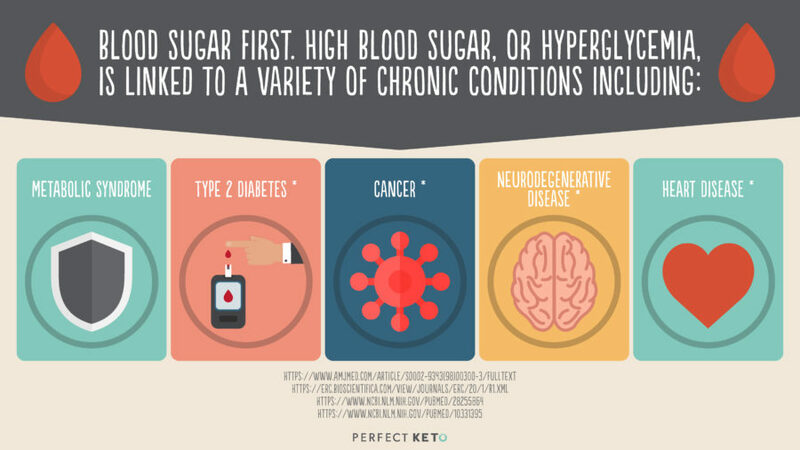 There’s no good research on healthy humans yet, but lots of people report an immediate boost in mental clarity and focus when they take exogenous ketones. Try them out and see how you feel. Stable blood sugar (even when you eat carbs). Exogenous ketones increase your glucose tolerance — your ability to process sugar and carbs without them spiking your blood sugar[*]. Oxford researchers recently compared the effects of ketone salts and ketone esters. They had healthy subjects drink either ketone salts or a ketone ester drink (sometimes with a meal, sometimes fasted), then measured a variety of biomarkers like free fatty acids, blood glucose, and blood ketone levels[*]. The main difference between the two is duration. Ketone esters give you a shorter, larger spike in ketones, while ketone salts give you a longer-lasting, more moderate spike in ketones. If you’re about to do a heavy workout and you want some extra energy, you may want to choose ketone esters. If you’re settling into work for the next 3-4 hours and you want effortless focus, ketone salts may be a better fuel source. After reading this list, you might want to give exogenous ketones a shot. The most convenient exogenous ketone supplement to get (and to take) are ketone salts. Perfect Keto Exogenous Ketone Base is a great place to start. It’s delicious, it mixes easily into water, coffee, smoothies, and so on, and it’ll give you an instant boost. 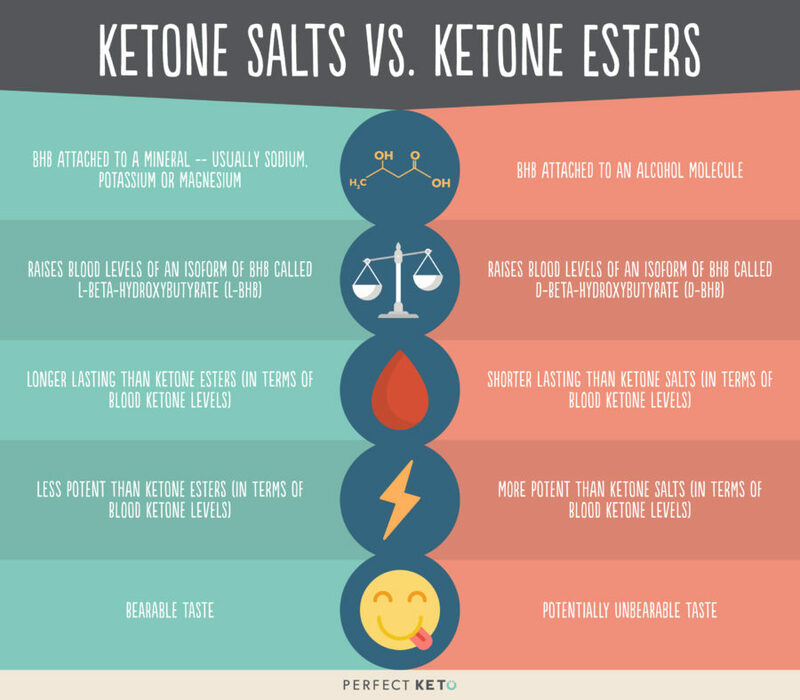 Ketone esters are harder to come by, and it’s tough to manage their taste. You can find them online, though, and some people prefer them. 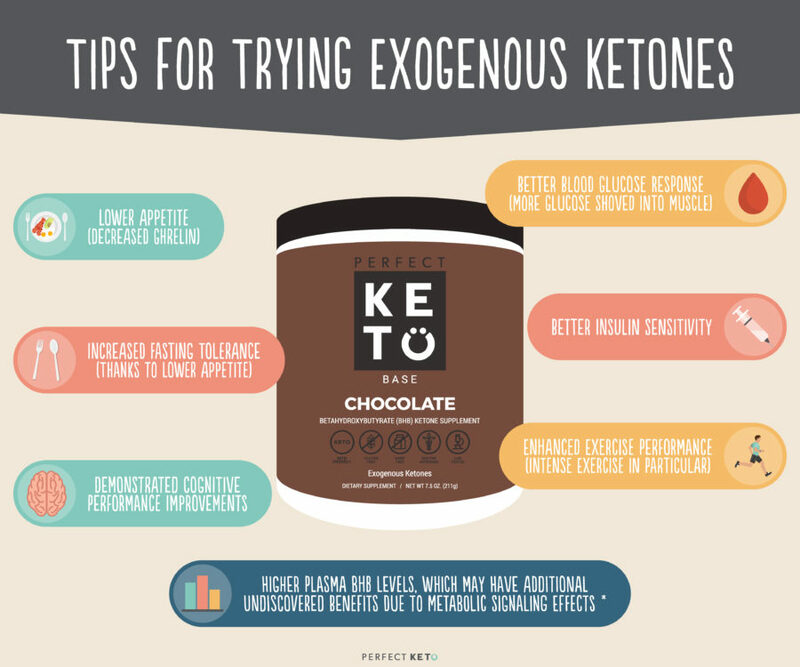 Can you use exogenous ketones alongside a healthy ketogenic diet? Absolutely. If you’re in nutritional ketosis, you can use exogenous ketones like a meal replacement when there aren’t any keto snacks around. Or as an energy boost before a workout or a big meeting at work. Whether you’re deep into ketosis, just starting out on the keto diet, or just want to try exogenous ketones as an energy boost — they’re worth a try.